The Colonel has a secret recipe. Coca-Cola locks up their secret formula in a vault. Our app has its own secret sauce: our feeds and features. 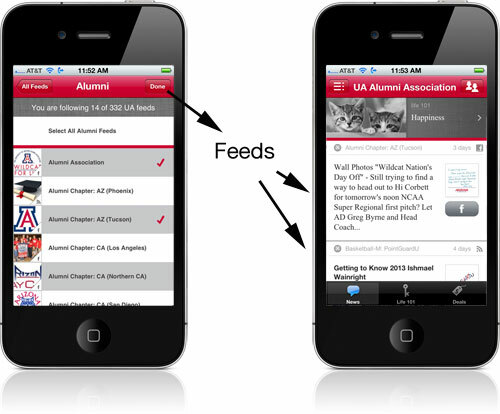 Feeds contain the stories told via your social media (Facebook, Flicker, YouTube, RSS, etc). The posts appear chronologically (most recent at the top), so if you include a lot of feeds, your app always has something fresh. Since users want news that is both fresh and relevant to them, they select feeds important to them (e.g. engineering and football). Your alumni return for news they want to read. Add as many feeds as possible (newspapers, clubs, blogs, and so on). With lots of feeds, you let users select niche interests from an institution they love. Think of features as “special messages” from your office which you want to get read or responded to. Features can include address update forms, event RSVPS, links to your website, and videos promoting your next event. Features appear every third item in your news feed and never disappear (users can’t turn them off and they never “roll down” your feed). When Bobby checks his news, he’ll see your features. Our buyers add and delete as many features as they’d like, and prioritize them in any order. 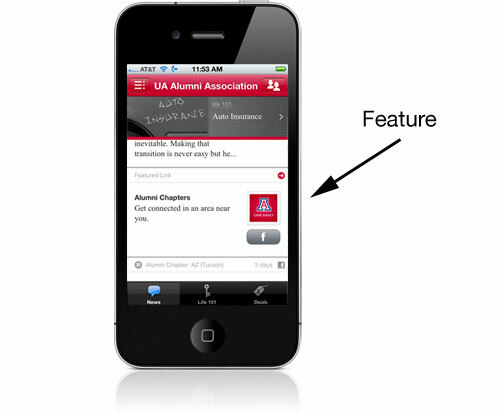 Update a feature and your app updates immediately. We think the reason our secret sauce works is its simplicity. Users read news they love in one simple place. Schools get their messages (features) read. So that’s our secret sauce. We think it’s better than a bucket of chicken and a medium-sized drink.